Director for Strategic Communications of the White House 29-year-old Hope Hicks knows how to outshine everyone. In Tokyo, for example, for an official dinner with the Japanese premier, instead of a traditional dress, she chose a black tuxedo with a white shirt and a butterfly. We took a closer look at the style of Hicks and offer our own version. 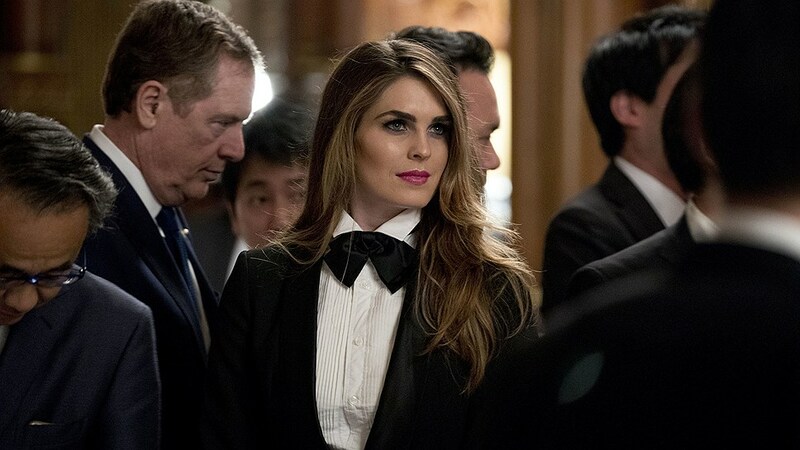 Despite the fact that the turnover in the White House is the same (Hicks is the fourth communications director since the election of Donald Trump as president of the United States, and her predecessor Anthony Scaramucci stayed on the post for only ten days), Hope is doing great. At a dinner party in honor of Donald Trump, given by Japanese Prime Minister Shinzo Abe at the State Guest House - Akasaka Palace, the 29-year-old Hope appeared in a tuxedo. Let's remind, Melania Trump and Hope Hicks travel with Donald Trump in Asia (except for Japan, the program of the 12-day tour includes South Korea, China, Vietnam and the Philippines). 7. Saint Laurent: Bow tie. She looked like a charming special agent from Hollywood movies, where now the James Bond is a woman. On the eve of the New Year, a bold idea should be adopted: the outfit will suit both a dinner party, and a trip to the theater, and for a party in an old mansion. As for Hicks, then there is a model chapter in her biography - in particular, she appeared in the advertisement of Ralph Lauren. In addition, Hope was promoting the fashion house Ivanka Trump. In 2016, she was one of the first to join Trump's presidential campaign team: it was she who decided who from the press could talk to Trump and who did not. This is what she is doing now. And, by the way, Hicks is the only one of those teams who ended up in the White House at the end of the race.